Advanced American Financial understands passions. As a local, independently owned insurance company, we focus on protecting your hobbies and the things you are passionate about. If you have a passion for classic cars and auto restoration, you need an insurance agent to help you protect your vehicles in your garage, on the road and at auto shows. 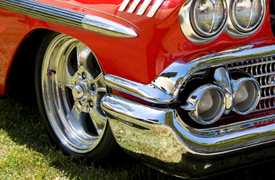 Insurance coverage on classic automobiles is much different from standard auto insurance. Although you probably don’t spend a lot of time driving your classic car, you do spend a lot of time and money to keep it in good condition. Your insurance policy should reflect these facts. Vehicle Usage: You can get an insurance policy with limited or unlimited vehicle usage. Limited-mileage policies start at a 1,000-mile maximum and may help you save money when insuring cars you seldom drive. Agreed Value: For a classic or antique vehicle, agreed-value coverage is generally better than a policy that only covers stated value or actual cash value. Special Roadside Assistance: If your classic car breaks down, you need more than standard towing insurance. With specialized roadside assistance coverage for classic cars you can make sure your automobile will be safely loaded on a flatbed for transportation. Contact Advanced American Financial today to learn more about specialized, affordable insurance for your classic cars. We look forward to protecting your hobby.